Elizabeth Schmidt discusses Foreign Intervention in Africa after the Cold War: Sovereignty, Responsibility, and the War on Terror. She will be joined in conversation by Bill Ayers. A Q&A and signing will follow the discussion. About the book: Outsiders often perceive Africa as a continent in crisis, and many blame Africans for their plight. Foreign Intervention in Africa after the Cold War challenges this position, arguing that many current crises are the result of foreign political and military intervention during the Cold War and its aftermath. Focusing on the post– Cold War period (1991–2017), Schmidt explores the rationales used to justify foreign political and military intervention, the purpose of those interventions, and their consequences. She illustrates her points with case studies from across the continent and considers the impact of extra-continental powers, neighboring states, intergovernmental organizations, and international terrorist networks. 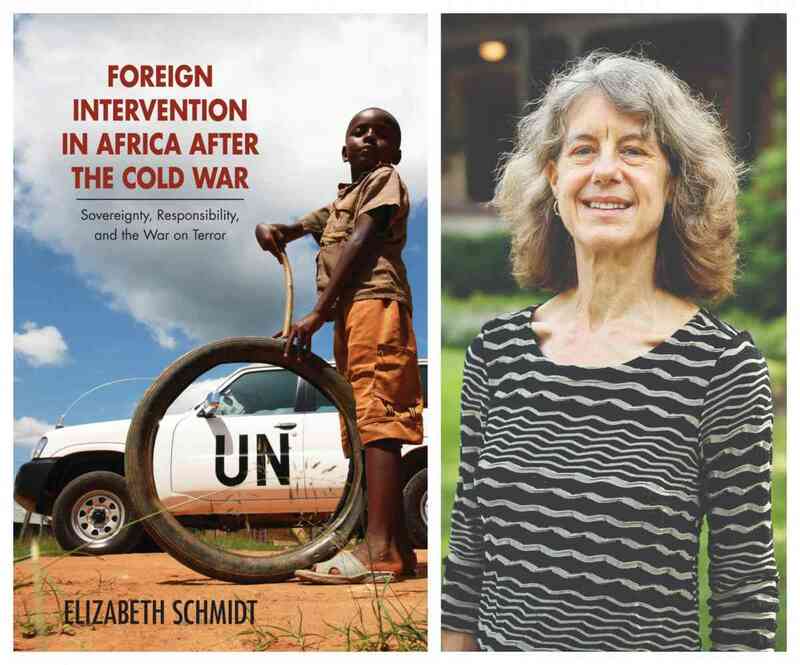 About the author: Elizabeth Schmidt is a professor of history at Loyola University Maryland. She received her Ph.D. from the University of Wisconsin and has written extensively about US involvement in apartheid South Africa, women under colonialism in Zimbabwe, the nationalist movement in Guinea, and foreign intervention in Africa from the Cold War to the war on terror. Her books include: Foreign Intervention in Africa after the Cold War: Sovereignty, Responsibility, and the War on Terror (Athens: Ohio University Press, 2018); Foreign Intervention in Africa: From the Cold War to the War on Terror (New York: Cambridge University Press, 2013); Cold War and Decolonization in Guinea, 1946-1958 (Athens: Ohio University Press, 2007); Mobilizing the Masses: Gender, Ethnicity, and Class in the Nationalist Movement in Guinea, 1939-1958 (Portsmouth, NH: Heinemann, 2005); Peasants, Traders, and Wives: Shona Women in the History of Zimbabwe, 1870-1939 (Portsmouth, NH: Heinemann, 1992); and Decoding Corporate Camouflage: U.S. Business Support for Apartheid (Washington, DC: Institute for Policy Studies, 1980). About the interlocutor: Bill Ayers is a social justice activist, teacher, Distinguished Professor of Education (retired) at the University of Illinois at Chicago, and author of two memoirs, Fugitive Days and Public Enemy.